Williams punctuates the poem only by use of a few capital letters, an apostrophe to indicate possession, and by the arrangement of the lines. However, formatted and punctuated differently, the poem could be used as a descriptive caption under a reprint of the painting in an art history book. And that's what I'd like you and a couple partners to do. 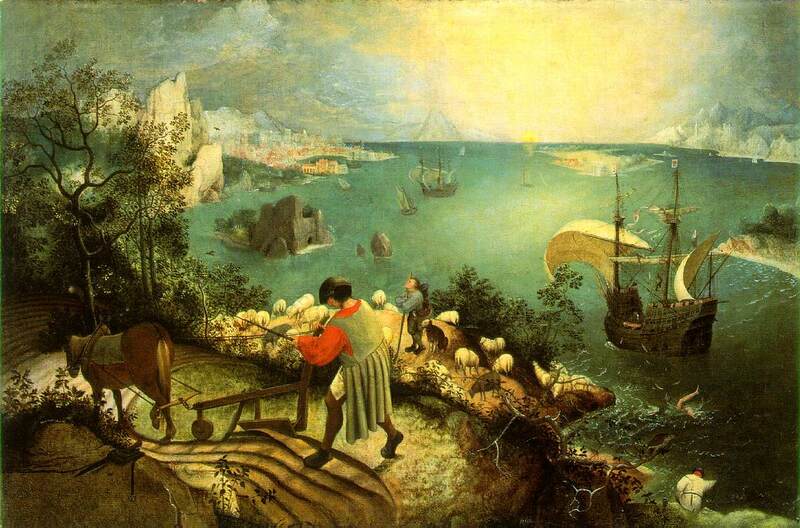 After you are familiar with the myth, come back to this page and study Bruegel's painting below; contemplate what the painting says about the nature of myths in the everyday world. On a "Microsoft Word" document with your names at the top, highlight the text of the poem, and click the copy command from the edit menu on your browser. Then paste the poem into your Word document. Without rewording it in any way, refomat the poem into prose sentences and punctuate them correctly so that it describes the painting and conveys its meaning. Please double space the whole document and place it in my mailbox in room 852, Templin Hall at the end of class. This is a group project and everyone in your group will get the same credit for it, so make sure you follow the instructions and participate in the discusion and preparation of the exercise.